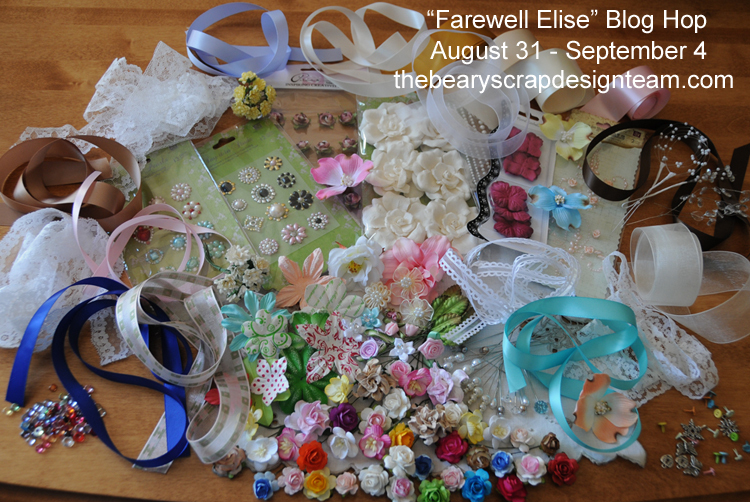 TBS Farewell Elise Blog Hop Surprise! Hello hello! That sound you hear is the collective wail of The Beary Scrappy Gals. *sigh* Today is Elise's last day on the team, and we're bidding farewell in true paper-crafty community style. First, I have to tell you a little about the Elise I know. In my early paper-crafting-meets-blogging days (October-ish of last year) I spent a lot of time exploring blogs and garnering inspiration as I tried to find my own card style. Elise was one of my early favorites. Her card style is so soft and pretty! Even though we both color with Prismacolor pencils, we have very different results. I adore her subtle coloring and have tried many times to duplicate it (impossible! *grin*). 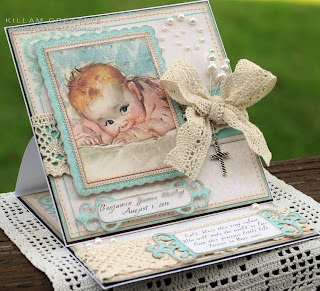 She has inspired me over and over with her use of Stickles and lace and flowers. Over time we've become online friends, and "see" one another in a few regular chatty spots. We're on the Crafting Life's Pieces DT together and have our own little eBay community. Right around my birthday in May I received a wonderful surprise from Elise. In my mailbox was a package with a lovely Elisabeth Bell stamp, ribbons and a load of delicious flowers. Included was a really kind note that made my week and still sits on my Inspiration Shelf. Elise, I admire your incredible enthusiasm for other crafters. Every time I read your comments on a blog I think how lucky that person is to "see" her own card through your eyes. You have taught me to look closely and appreciate every little detail of a project. I love that you opened my eyes! You are a good friend to me. This is the end of one chapter, but not the end of our story. Thank you for being you! I've tucked a tag to write my sappy note to Elise before I pop this little lovely in the mail. Here's a side view of Fairy Dust Tilda's layers. 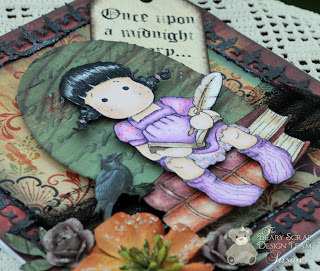 I stamped her on the base layer for the twinkles around Tilda, and added three layers on top. Please visit each blog, and as you're crying along with us, be sure to become a follower if you're not already *and* leave a comment. Please post our candy on your blog, too. At the end, go to The Beary Scrap Design Team blog and let us know you followed along - you could win (even if you're international)! The hop is open through Saturday, September 4th, and we'll announce a random winner from all the comments on Sunday. 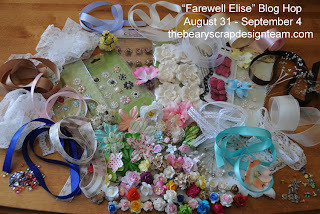 The prize is an assortment of embellishments* you'll find on Elise's fabulous projects: satin and sheer ribbons, lace, pearls, pins, little baubles and delicious flowers flowers flowers! Thanks for helping us bid a fond farewell to Elise! 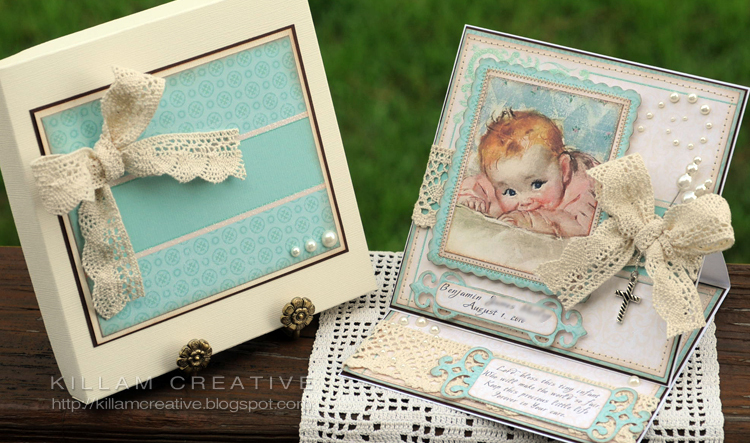 Oh, and don't forget to pop on over to her beautiful blog - Paper Love Affair. Friday Sketchers #117 (9/2): Sketch - love this one! I was also influenced by Claudia's card - thanks for the inspiration! Aaanyway... We had a couple of unnaturally cool days here in Maryland. Of course this led my thoughts down the Autumn path, and here I am with a Halloween card. Haha! Ok, I have to admit I found this paper when I made my surprise attack on Kimm at The Beary Scrap a short while ago. On my first visit to the store I wanted to take one of everything home, but settled on papers... embellishments... and tools. Oh stop! Of course I left you some - go check it out! One line of papers I *couldn't* leave on the shelves was Cosmo Cricket's Haunted. It's delicious! As I write this, it's not in the online shop, but feel free to give Kimm a call at the store and she can set you up with it, too. :) I tell ya, it's SO worth it! The design team's projects this week are based on our September 1st BSC #9 sketch challenge - you'll see the sketch "officially" when you visit here on Wednesday. Here's little Tilda as she channels Edgar Allen Poe for the season. I like to think she's writing invitations to a Halloween party. Will you come? 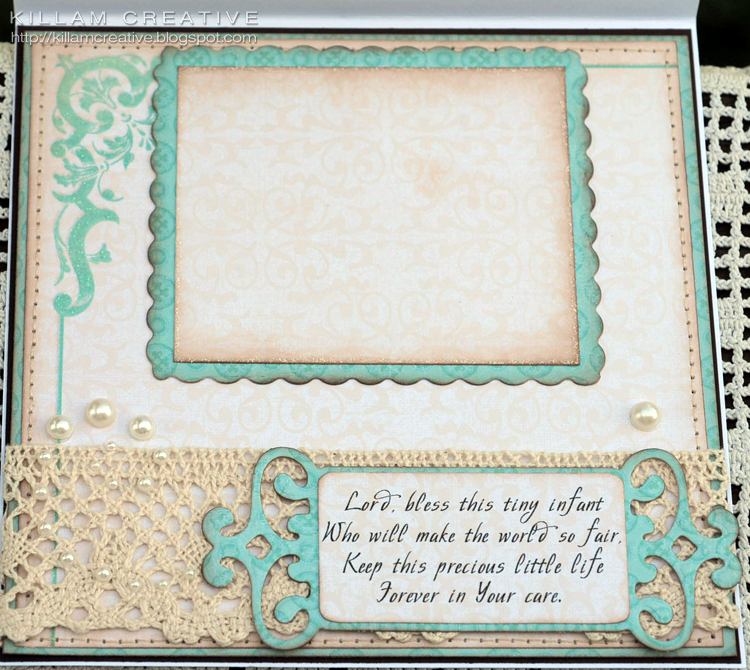 Stampin' for the Weekend #45 (ends 9/2 ): Anything Goes! So, there's *only* one more day to enter our current challenge - In Stitches. If you've included stitching in any form -machine, hand, faux- we'd love to have you enter our challenge. You could win $20 gift voucher from The Beary Scrap! We'll have a new challenge for you on Wednesday (can you believe it's the 1st of September already?!) and there's a little surprise in store tomorrow. Be sure to check back at the design team blog and see what we have up our collective sleeve! "Self, why don't you cruise on up the turnpike and surprise Kimm at The Beary Scrap?" And so I did Saturday morning! I walked in to her adorable boutique and watched as she flitted about with the customers. She slowed down long enough for me to show my face, and she stopped in her tracks. You know that feeling when you think you recognize someone but you're not sure and don't want to embarrass yourself... I saw all that going through her mind, including the slight head tilt and eye narrowing... I said, "It's Susan," and I swear she squealed! (With joy... really!) Ah, I'm getting teary-eyed just writing about it. Big hugs, dear Kimm! I enjoyed our time together more than I can write here. It was cool to stand in your shop and see the shelves from which you pull my monthly order. Your shop is wonderful and I can't wait to meet up again! Ok, now on to the design team's weekly theme, which is "Dog Days of Summer". It's almost the end of August and kids are returning to school in the next few weeks. Can you believe it? That sound you hear is the collective cheer of parents everywhere! I had trouble with this theme at first. What does "dog days of summer" mean to me? Mosquitos. Hmm... Nope, can't put a mosquito on a card... I knew I wanted to use my fabulous new Echo Park paper, so I started from that happy point and landed here... on a big, fluffy yellow lab! Of course, I had to glitter my little one up a bit. I used Faded Jeans Distress Stickles on the puppy collar and "regular" Stickles Lime Green and Star Dust on her dress and bloomers. Love the bloomers! While at The Beary Scrap (heeheehee) I found these fabby crocheted flowers. Pretty, no? I've also amassed quite a collection of the We R Memory Keepers Designer Snaps, 'cause they're a great way to add sparklies or a sentiment for the sentiment-challenged like me. The variety of sizes in each pack definitely make your dollars go far. Oh, and the last 2 cards I've used them on were Crop-A-Dile free! (The mega eyelet setting tool that you're supposed to use to attach these little buggers.) 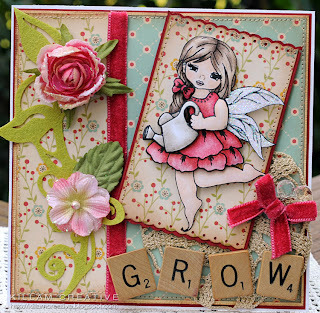 On the last card I glued lace and this card I used the flower and then used Fabri-Tac or Aleene's (can't remember) to attach to the card. The added lace/crochet takes up the space and prevents wobble once it's on the card. So, that is all. I think this is the longest post I've done - I and *know* I've waffled on a lot before today... I thank you from the bottom of my happy heart that you've stuck with me. Thank you! Stamp: Mo Manning's Digital Pencil Too - "Buds"
Yay! Thanks so much for stopping in today. 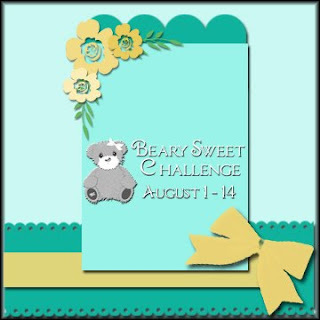 Don't forget our current Beary Sweet Challenge "In Stitches"! You can enter with any kind of faux or real sewing and have a chance to win a $20 gift voucher from The Beary Scrap! Hello hello again! Thanks for popping in today. It was a great weekend here in Maryland - got lots done around the house and had many giggles with the Husband. He's a card! So, we kicked off a new Beary Sweet Challenge yesterday - "In Stitches". I hope you can play along with us! 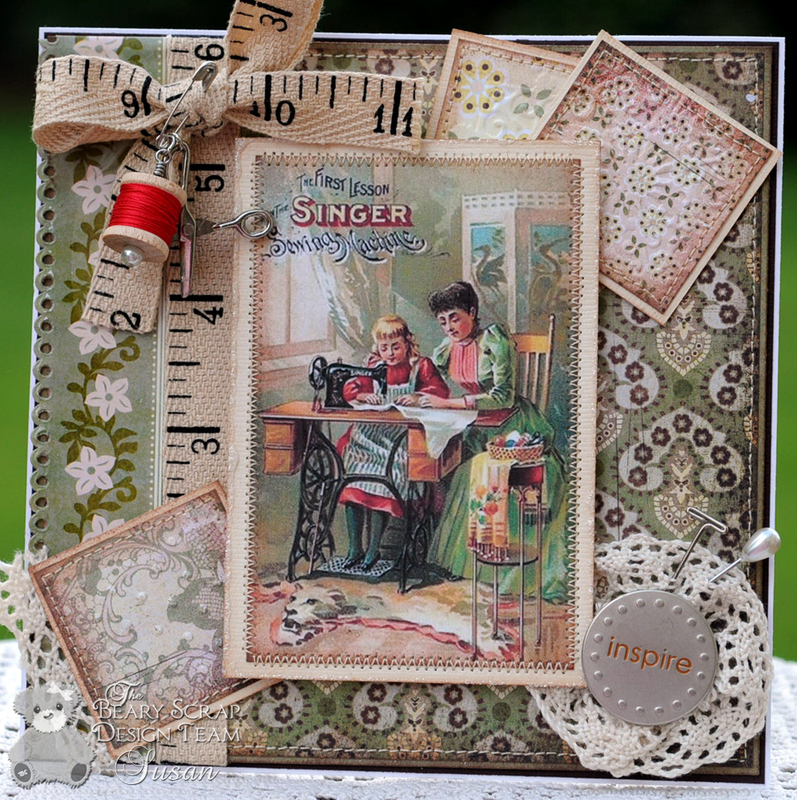 I've been noodling around with the idea of a vintage sewing inspired card lately. I collect vintage sewing stuff, so it's always on my mind in some form or another. At an estate sale years ago, I found a 1924 Singer Model 66 in it's cabinet with the cool drawers and scrolly iron base. The wood top had some cosmetic problems but the machine itself was in great shape. I recently sold it on Craigslist (without the drawers!) since I will be receiving Grandma's machine in a few weeks. It's in excellent condition and I'm very excited! I Googled "vintage sewing" images and found this beauty. I popped it into Photoshop, upped the resolution and sharpened it a bit. I think it turned out pretty well! I used Basic Grey's Capella papers - it's such a beautiful variety of prints. I was able to use 4 different Capella prints as well as the coordinating solid green layer. Oh, and the pattern along the left side is from the Capella ribbon tape set. Pretty! I wrapped a tiny spool with coordinating thread and made it into a charm. I have no idea where the scissors charm came from... I don't remember seeing it in my collection before today. Weird, huh? The stick and t-pins are both from Grandma's sewing box. Thanks again, G-ma! Thanks again for stopping to visit today. Be sure to check out the Beary Scrap Design Team blog for Elise's answer to our BSC #8: In Stitches challenge. Hope to see you back for another visit, and can't wait to see your entry, too! Hello and good day fellow crafters! I want to share with you a bit of good fortune I've received lately and show some love to a couple of challenges and shops. A randomizer thingy picked my entry for June's drawing at Creative Prompts For You. I won 2 cute little stamp sets from My Stamp Box. This is my entry, which still holds the "All-Time Favorite" honor in my mind. 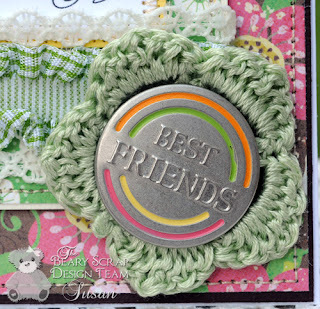 I won the July blog candy over at Michelle's Scrapbooking and More. What?! That never happens! The prize is fantastic (yay! another Magnolia! 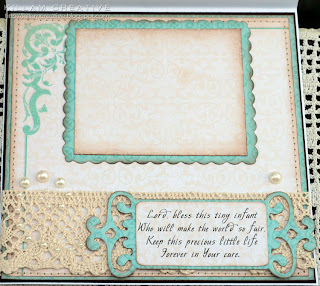 ), and includes Tim Holtz embossing folders (drool drool) *and* a stamp designed by Sandra Hammer, a new friend in blogland. How cool is that? And, last but not least... 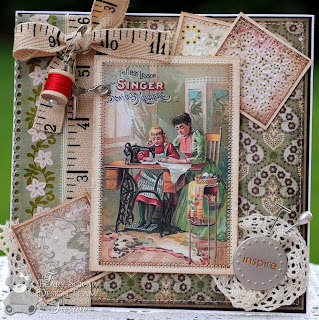 I won a $20 gift voucher from Stamp and Create for their stitching challenge. Lacy, the owner of S & C is really nice! Here is my entry. I can't wait to get my goodies! Cheers to everyone. I hope the stars shine down on you, too. Baby Boy Baptism - Aww! Hello dear friends! I'm here on a rare Thursday to share a card made for a friend. I dearly love this card (um...er... is that bad?). 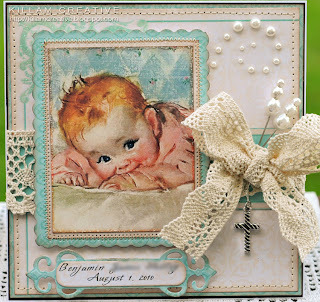 The baby is a vintage image I found poking around the internet. I loves me some Google! 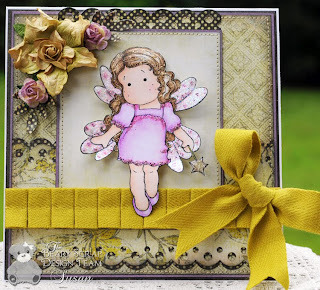 TBS DT: Princess Tilda Sparkles! Hello dear readers! 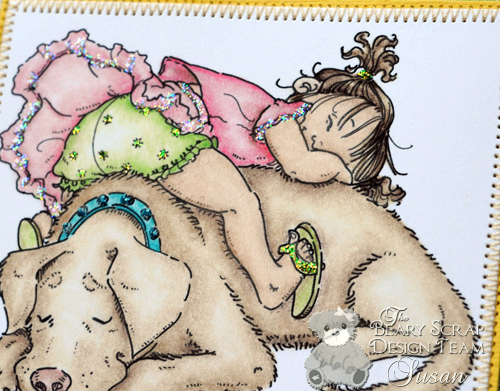 It's another great week with The Beary Scrap Design Team! This week we want you to put your shades on 'cause we're full of Sparkle and Bling! I've kept things simple this week and used the current Midnight Madness sketch as inspiration. I do love a good MM challenge, and can't wait to see the one we're sponsoring August 10 - 16 !! This card started out with a peacock feather in the upper right corner but the more I looked at it the more I thought it was looking back at me. *grin* It was unsettling! Isn't Princess Tilda just the sweetest? She's wearing a costume full of Stickles, from the Platinum on her tiara to the Frosted Lace gloves and skirt. Her dress is enhanced with clear Sakura Gelly Roll pen and the buttons on her sweet little shoes are Star Dust Stickles. The card's outside layer is edged with Stickles Icicle -a larger reflective surface that leans toward golds- and the inside layer closer to Tilda is edged with Diamond. The particles are smaller than Icicle but also reflect golds as well as the colors around it. Star Dust is randomly dotted on Tilda's background. Thanks so much for stopping in! Don't forget our current Beary Sweet Challenge is going on HERE. It's a "Simple Sketch" and we look forward to your entries by August 14th! Hello! I hope everyone had a great weekend. We had beautiful weather which lead to yard work and a day trip to Annapolis, Maryland. It's such a picturesque historic town! This week at the Beary Scrap we're trying to keep it simple with our CAS (Clean and Simple) Sketch Challenge... Oh my, this was difficult for me! My "simplicity" was only one stamp layer (really!) and no embellishment beyond the sketch. Ok, I admit that I've failed in the CAS department... *sheesh* The design team is going to fire me - LOL! I've used Pink Paislee's Queen Bee papers. I really like the yellow/gray combination! The twill ribbon is also Queen Bee, called "Ribbon Pleats". The package has 2 - 12x12 ribbons, one in this yellow color and one in gray. I measured out the amount of pleat I needed and then pulled the stitching from the remaining ribbon. It too a little water spritz and iron to straighten it out, but I love the end result. Stamp - Magnolia "Flying Tilda"
Here's the BSC #7 Sketch - you have until August 14th to enter and you could win a $20 gift voucher from The Beary Scrap! Go HERE for all the details. Thanks so much for stopping in today. The design team will have fun samples for you all week, so be sure to visit the design team blog all week for inspiration. We look forward to your Clean and Simple projects! CLP #28 - Come Grow With Us! Hello hello! Ooh, it's the first of the month and you know what that means, right? 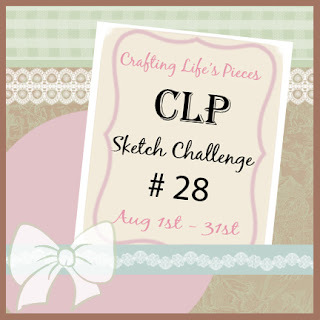 It's CLP sketch challenge time! I always get excited to work on my CLP project - I'm a Procrastinator Extraordinaire, so I don't usually start any deadline project until it's just about due. *wink* I honestly feel most creative under pressure. CLP sketches always get my juices flowing and I tend to try new things. Love it! 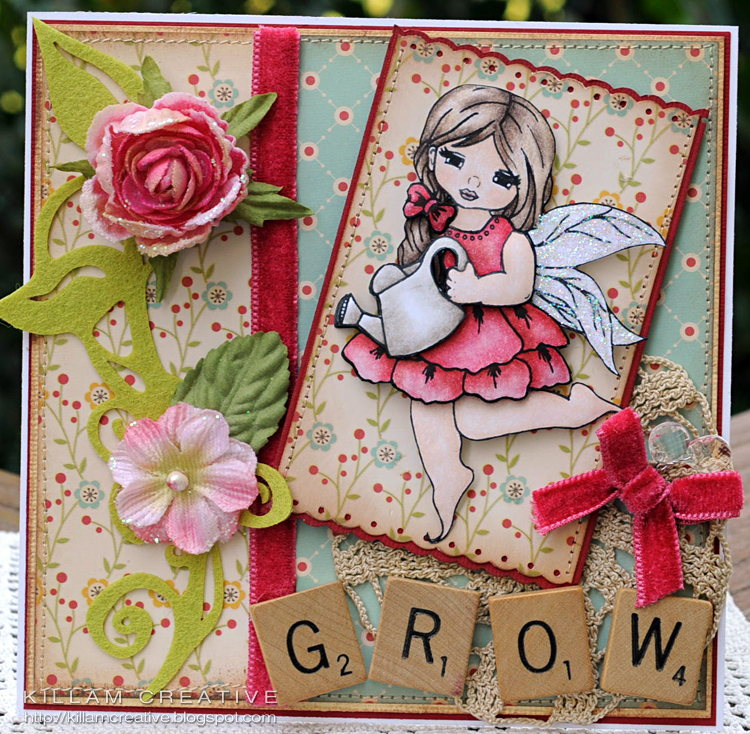 So this month many of the fabulous design team got to work with Chelsea's new Gurlee Girl Blossom Fairies stamps. OMG! I couldn't believe my eyeballs when I opened the mail and found ALL THREE beauties! Which one to use first? Oh, the choices! So, you wanna come play with us? Here's the CLP #28 fine print: Make a project with this fabby sketch, upload by 8/31 and link back to CLP in your blog post. How's that for easy? I hope to see you there! Tomorrow I'll have a new Beary Sweet Challenge project for ya, and I'm over-the-moon excited to share a special-order Baptism card later in the week. It's so sweet! Thanks for stopping in, and I hope you treat yourself well today.